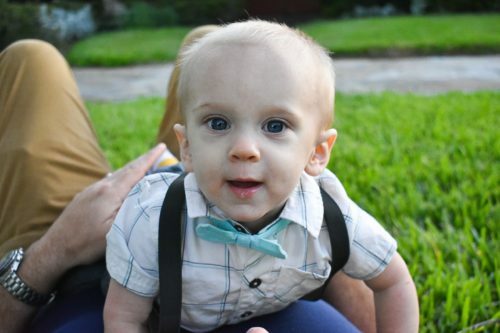 An active infant, Liam is a happy baby and has a smile that lights up the room wherever he goes. That morning, Liam pulled himself up – a new activity he was learning – by holding onto the family’s coffee table. Liam was so excited about his latest accomplishment. Seconds later, he let go of the table. Instead of falling backwards, Liam tumbled to the side, hitting his head on the table’s metal leg. Even though his mom and dad were right there, it happened abruptly and they couldn’t stop the fall. How quickly things changed. Payne called Liam’s pediatrician, Amy Pavlou, MD, of Pediatric Associates of Brunswick. Dr. Pavlou recommended they bring Liam immediately to the Emergency Care Center at Southeast Georgia Health System’s Brunswick campus, where they were seen by emergency physician Maria Wolf, MD. A CT scan confirmed Liam had suffered a life-threatening epidural hematoma from head trauma. Dr. Wolf reached out to Wolfson Children’s Hospital of Jacksonville, which provides pediatric specialty care to children of all ages from North Florida, South Georgia and beyond. Pediatric neurosurgeon Philipp Aldana, MD, co-medical director of the Stys Neuroscience Institute at Wolfson Children’s, recommended emergency surgery. 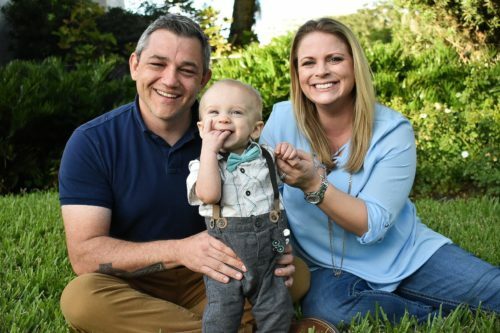 The relationship between Southeast Georgia Health System and Wolfson Children’s helped facilitate rapid coordination of care for Liam, who was transferred from Southeast Georgia Health System by helicopter to Wolfson Children’s. Dr. Aldana and the team at Wolfson Children’s were waiting for Liam when he arrived. In Liam’s case, his life depended on brain surgery. He had an epidural hematoma, bleeding that happens between the outer membrane covering the brain (dura mater) and the skull as a result of head trauma. Liam’s case is not common and only occurs in about three percent of children. Only about a tenth of those children require emergency brain surgery. Liam spent three days at Wolfson Children’s before he was discharged to go home. Liam’s incision is healing, and “Little Hulk” is active, happy and alert. Liam will continue to receive follow-up care with Dr. Aldana at Wolfson Children’s Hospital. Whether a child has just received a diagnosis of a neurological disorder or needs ongoing care for his or her condition, the experts at Wolfson Children’s Hospital’s Stys Neuroscience Institute provide early diagnosis, intervention and treatment, and ongoing care for children with neurological conditions. The Stys Neuroscience Institute is a collaboration between Nemours Children’s Specialty Care, Jacksonville, and the University of Florida College of Medicine – Jacksonville, plus other health care institutions that brings together a multispecialty team to help children with brain, spine, skull-base and other neurological conditions. Recently, Wolfson Children’s Hospital of Jacksonville was ranked among the Best Children’s Hospitals in the nation by US News & World Report for its programs to treat cancer and complex neurologic disorders. Wolfson Children’s neurosurgery and neurology programs have been consistently recognized by U.S. News & World Report for nearly a decade. Pediatric outpatient specialty care is also offered at Wolfson Children’s at Southeast Georgia Health System, a specialty center located on the campus of the Brunswick hospital.